Ross, quick question / comment. I jump rope between three and four times a week usually as part of intervals. Recently, after switching my Gym I feel like I have developed shin splints, as the gym floor I have is concrete and there is nothing but a hard rubber pad on top of it. Seeing as how my garage is also concrete, is there some way to lessen the impact on the floor, I know that you have come up with some great home made devices, & I was trying to figure out if I made some sort of wooden platform that had a little more give, if it would help me out. Any thoughts on this? Thanks so much for your awesome website. Landing softer would be my first suggestion. I don’t say this to suggest that you shouldn’t change the floor surface, but rather to remind you that it might have more to do with how you are skipping (rather than where you are skipping). As for options, horse stall mats are fairly common (3/4″ mats). That will provide adequate cushion in most cases. I’ve also always been a fan of simple additions such as calf raises and toe taps. I found good sneakers like Asics help a lot and I do them on the balls of my feet and that seems to help me with the issues you describe. But surface is key like you mentioned. @John – Thanks, but that’s just where I keep my saw. I suppose there’s a workout to be had from dragging and splitting the logs afterward though! @Adrian – I wouldn’t limit yourself to double unders. You’d be better off skipping for longer periods (ex. multiple 3 minute rounds like a boxer). 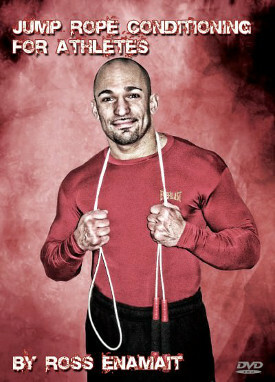 You can then mix in a variety of skipping styles (including double unders during each round).